Repairs all non-ferrous alloy such as aluminum, cast aluminum, zinc, pewter, aluminum magnesium, pot metal, silver, copper, bronze, titanium, any metal except steel. Ideal for aluminium repairs and restoration work, general maintenance or fabrication jobs for the professional workshop, DIY enthusiast or Hobbyist. Requires No Flux. Metal-to-Metal Bond. 100% Metal Alloy. Stronger than the Base Metal - up to 45,900 PSI. Low Temperature. Between 380oC - 408oC Working Temperature. Over 260oC Below Melt Point of Aluminium. Stores Safely and Indefinitely. Simple - Versatile - Portable - inexpensive. 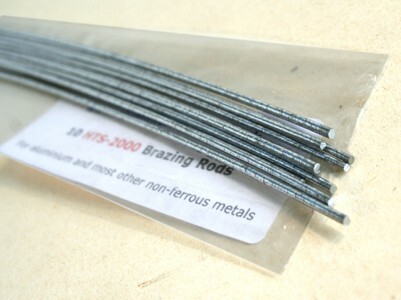 Brazes all Aluminium Alloys, including zinc, magnesium, pot metal, and cast.